Glymjack, going for a dramatic ending to their 'show' — a crowd‑free gig recorded at The Junction in Cambridge. To showcase the band to promoters and festival bookers, singer‑songwriter Greg McDonald wanted to film an 'as live' main‑stage performance by the full band line‑up. Singer‑songwriter Greg McDonald has been a willing guinea pig for several SOS articles in the past, and even featured on the cover back in July 2012, helping me to try out different techniques for miking a singing guitarist. It's fair to say that we probably owed him a favour, and nearly seven years later the opportunity arose. Greg's latest project is Glymjack, a folk band that scales to fit different scenarios. 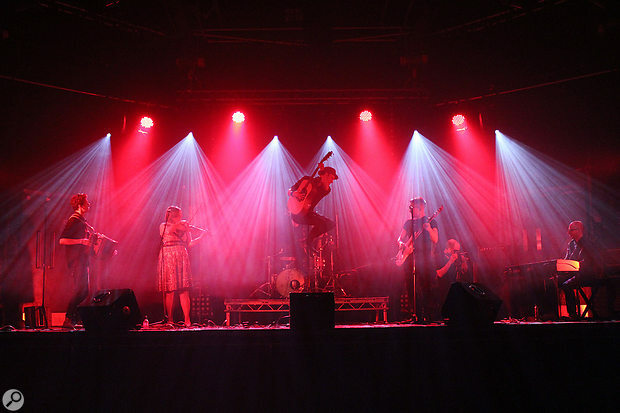 The idea is that small promoters can book Greg on his own, or as a duo with fiddle player Gemma Gayner, while for bigger gigs the band can be expanded to include any or all of melodeon player Saul Bailey, bassist Dickon Collinson, pianist Art Toper and drummer Evan Carson. To showcase the band to promoters and festival bookers, Greg wanted to film an 'as live' main‑stage performance by the full line‑up. My role was to handle live sound, recording and mixing. Film‑maker Henry Williams had been hired to take care of the video work, and with Luke Webb providing a suitably stadium‑tastic light show, this would to all intents and purposes be a live gig without an audience. Greg had arranged for the non‑gig to take place at The Junction in Cambridge. This is a purpose‑built 800‑capacity venue with an appropriately expansive stage, and acoustics that could politely be described as challenging — it's basically a brutalist hexagonal box faced with bare breeze blocks. Venue availability meant that we had just eight hours in which to set up, soundcheck, film and break the equipment down. It's impossible to plan too carefully for a location recording, and this one required more preparation than most. We decided from the off that we would bring our own sound system rather than attempting to use the house PA; I wasn't confident that I could set up and drive the latter from a standing start, and in any case, most of it wasn't rigged that day. With no audience to cater for, the goal was to provide just enough amplification to make sure the band could hear themselves, without spill compromising the recorded sound too much. My original idea was to rig a conventional PA system backwards, with the speakers pointing towards the band rather than out into the audience. This would have got the speakers off the stage and into the deepest nulls of all the vocal mics, but my best‑laid plans came to nought when the PA we'd arranged to borrow fell through at the last minute. Instead, we were forced to rely on a motley assortment of small speakers that weren't really up to the task of covering such a large stage from any distance. It was also clear that speakers 'in the audience' would get in Henry's way, so I decided to use them as conventional floor wedges instead. As luck would have it, the gig came along at exactly the same time that Zoom's L‑20 LiveTrak arrived at SOS Towers for review. This seemed like the perfect tool for the job, being capable of simultaneously recording multitrack audio to SD card, acting as an audio interface and providing up to seven different mixes for performers. The only thing it can't do is record or spit out any form of timecode signal, but Henry said he was happy to do without and sync audio and video by eye. My plan was to use the Zoom as an audio interface but also to record to SD card as a backup. In this mode, it effectively offers 16 mic inputs and two additional line inputs — there are four of the latter in total, but they're shared with the stereo returns from the computer. All the sources on stage were connected, via a stagebox, to a Zoom L‑20 multitrack recorder, which acted as audio interface and recorded simultaneously to SD card. I'd sent enough emails prior to the session to be pretty certain that 18 tracks would be sufficient. Today's professional musicians usually give a lot of thought as to how best to amplify their own instruments on stage, and that was certainly true of everyone involved in this project, so in many cases, all I had to do was supply a long enough XLR cable. Saul had fitted both of his melodeons with a clip‑on mic to handle the treble and a PZM inside the bass end, Gemma's fiddle had a pickup with a dedicated active preamp box, keyboards were all‑digital and Greg's guitar has an under‑saddle pickup, so the only things that absolutely needed miking were vocals and drums, though I also miked the bass cab as well as taking a DI. My miking scheme had been planned reasonably methodically in advance, and required only minor changes on the day. One of these was to switch my overhead mics into hypercardioid rather than cardioid, in order to keep spill from the wedges to a minimum; the other was to take Evan's word that the best way to mic his pandero (a percussion instrument that looks like a tambourine and sounds like a thousand bison galloping across the prairies) was with his own Shure Beta 52. 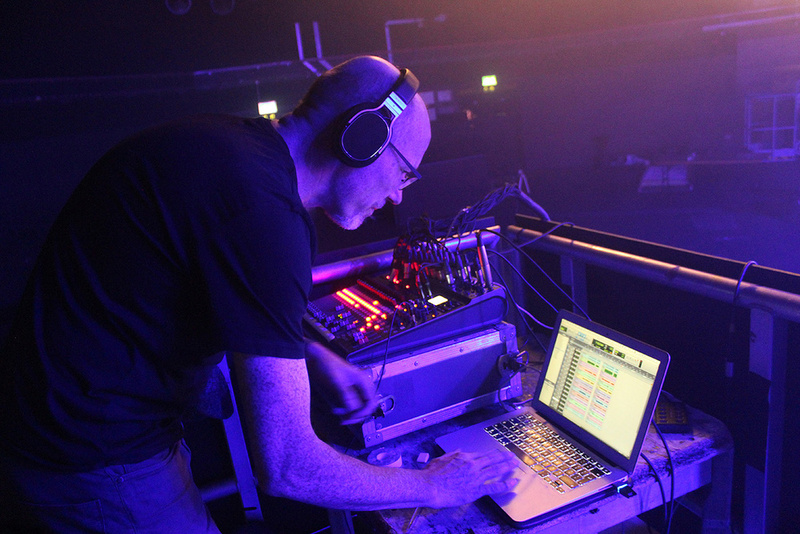 Thankfully, I'd insisted that Greg hire a 24‑channel stage box and snake, which helped keep things tidy and allowed me to take up station to side of stage, out of shot of the video cameras. One thing that proved absolutely invaluable on this session was the fact that 14 of the LiveTrak's 16 mic inputs have switchable pads. In total, I ended up with three separate monitor feeds: one for the two main monitors at the front of the stage, an additional 'more me' speaker for Greg and a personal monitor for Art so that he could better hear his keyboards. Evan travels with a personal in‑ear monitor system, which supplies click and uses the kick‑drum mic to trigger a drum‑stool shaker and, slightly to my surprise, he didn't want to hear any additional vocals or guitars, so I didn't need to generate a monitor mix for him. The 'catch and update' fader system used by the L‑20 takes a bit of getting used to, so there were occasions when I found myself making fader moves that did nothing or affected the wrong monitor mix, but this was down to my lack of flight time rather than any failing on the Zoom's part. Setting all of this up was laborious, but nothing broke or inexplicably refused to function, so we were ready to soundcheck by about midday. This was where things got a bit difficult, because it turned out that Greg likes to hear his own vocal very, very loud on stage. In combination with an unfamiliar and empty venue, cheap PA speakers being pushed beyond their comfort zone, and the need for me to manage three monitor mixes while simultaneously handling recording, this made it pretty hard to get a balance that everyone was happy with. Stage volume proved a challenge throughout the afternoon, and several takes were marred by occasional feedback whistles. There were also moments where Gemma struggled to hear herself well enough to pitch accurately. A more leftfield source of problems was the drum riser. This was a fairly standard affair made of two bits of staging bolted together, and proved very effective at transmitting movement from Evan's foot to the overhead mic stands. Despite being on a heavy orchestral stand, the left overhead mic was sometimes nodding up and down in time with the music by a couple of inches. Listening to playback on my headphones, I couldn't hear any problem with the audio, so made the slightly heart‑in‑mouth decision to keep the session going rather than use up precious time looking for a solution. Because the songs were tightly arranged, and mostly performed to a click, the band were able to do multiple takes of each one, with Henry shooting video from different angles each time. The idea was that with each performance being very similar, it should be possible to edit a master audio comp on purely musical grounds, in the expectation that it would fit whatever video edit Henry and Greg settled on. This also gave Greg time to properly warm up his voice for each song. In total, we recorded nine or 10 takes each of the three songs, and eventually ran out of time after take five of the band's instrumental set. 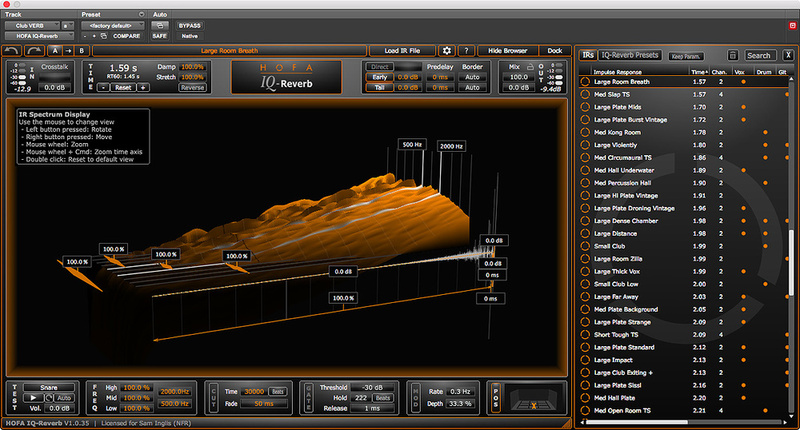 Several takes of each song were recorded, each to a click. This allowed takes to be comped and still be in sync with the video edits. 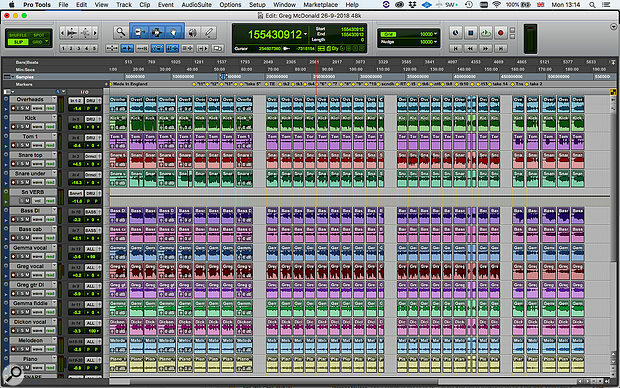 The job of evaluating and comping 30‑plus four‑minute takes is not trivial, and although I planned to mix the sessions myself, I was very happy to hand the Pro Tools files over to Greg for editing. To say that he approached this job with attention to detail would be an understatement, and a few days later, he sent over nicely topped and tailed Pro Tools sessions with all his edits consolidated. All things considered, the recorded files weren't in bad shape. Evan is an unbelievably tight drummer who knows exactly how to set up and tune his kit, so recording him is like falling off a log. The DI'd sources were clean and respectable, if sometimes unnatural in the way that only piezo pickups can be; and if they didn't completely eliminate leakage and mechanical noise, Saul's melodeon‑miking arrangements worked better than anything I could have rigged on the day. However, one of the odd things about this sort of recording is that because everything is either close‑miked or DI'd, most of what you end up with sounds nothing like it did in the room. In fact, because the space itself is huge, even the drum overheads don't really pick up many early reflections, so the whole thing can sound rather flat and clinical. The obvious answer is to put up room mics, but for several reasons, I didn't think it worth doing in this case. There was no audience reaction to capture, the lack of bodies made the venue itself pretty unforgiving, and as we weren't using any front‑of‑house speakers, there wasn't anything going on in the room that you'd actually want to capture on disk. So, although the raw multitrack sounded clean and clear, it lacked the energy and atmosphere that a live recording should have. The challenge, from the mixing perspective, was how to restore this liveliness without exaggerating the unpleasant aspects of the spill and so forth. Unsurprisingly, the key to solving this was reverb, and by the time I'd finished the mixes I was using no fewer than four separate reverb auxes in Pro Tools. Two of these were used only on the drums and another was tailored specifically for the vocals, but the most important was an impulse response from HOFA's IQ‑Reverb that seemed to me to offer a good approximation to how you'd want an ideal venue of that sort of size to sound. With the sole exception of the bass guitar, everything was fed through this to a greater or lesser degree. 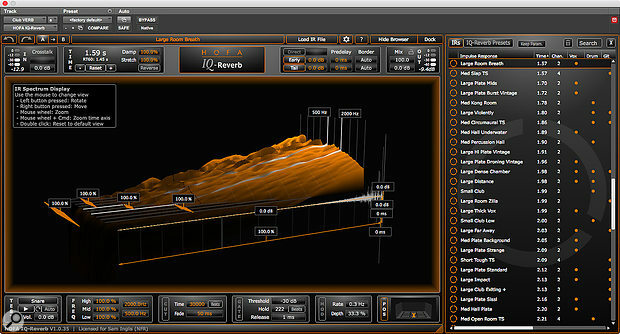 The raw multitracks lacked the excitement of a live performance, but the use of several reverb plug‑ins — particularly an IR in HOFA's IQ‑Reverb, — addressed that. The unnatural and/or compromised sound of some of the individual sources sometimes meant that more processing was required than might be the case with a studio recording. That was probably most noticeable here on Gemma's fiddle: the pickup produced quite a dark sound, but simultaneously seemed to exaggerate any roughness, so that merely adding treble made things scratchy and harsh. Resorting to multi‑band compression seemed to help, and, being completely spill‑free, it could be drenched in reverb and delay. Acoustic guitars recorded through piezo pickups usually throw up similar problems, but in this case, the instrument could be kept at a fairly low level in the mix, where the aggressive sound actually worked quite well. Greg had had the idea of copying some sections to another track and applying an amp simulator to beef up the choruses, and this was very effective. The voice tracks were obviously never going to be comparable with studio vocals. Not only was there quite a bit of spill from the drums and the stage monitors, but there were also plenty of plosive bursts and tonal changes as the singers moved on‑ and off‑mic. Processing can help up to a point here, but heavy compression isn't an option with this level of spill, and only detailed volume automation could keep the vocals at a consistent level in the mix. 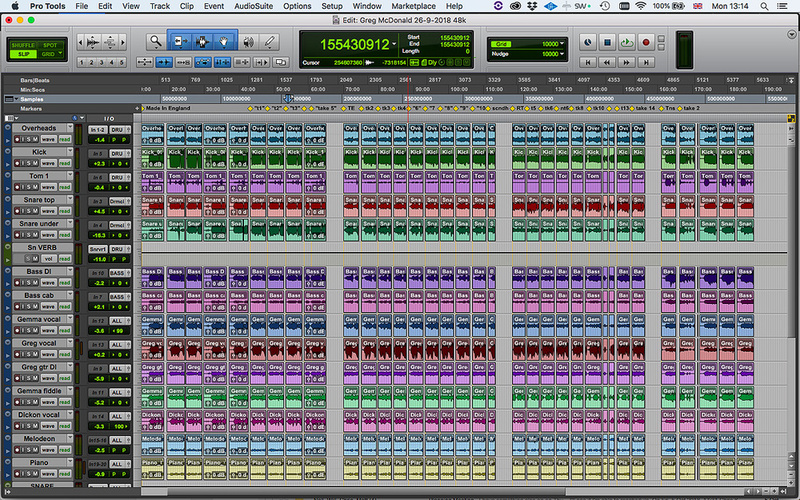 This was probably the most time‑consuming aspect of the mixing process. There was, of course, much more to the mix, but most of it was fairly standard stuff: filtering out unwanted low end, optimising phase relationships between bass DI and cab mic, using expanders to improve separation on the drum mics, and so on. The most difficult thing from my point of view was getting the entire mix to sound the way Greg wanted it to. I tend to prefer mixes that are warm, open, dynamic and fairly dry; Greg wanted everything to be brighter, louder, hotter and, above all, "more epic". Achieving the right degree of epicness required not only more reverb than I'd normally be comfortable with, but no fewer than four separate equalisers on the master bus, adding progressively more top end. After a couple of rounds of email Pong I eventually came up with something that met Greg's expectations without mortally offending my own tastes. Greg also belongs to that generation of artists who are children of the loudness wars, and who embrace aggressive limiting as an artistic choice. I explained that this could be counter‑productive in tracks destined for YouTube, with its built‑in loudness normalisation; there was already more compression and limiting on the master bus than I would usually use, and Ian Shepherd's Loudness Penalty web site (www.loudnesspenalty.com) reported that YouTube would turn down our limited mix by 3dB or so. I gave mastering engineer Julien Courtois, of Masterplus in Paris, a choice of using a mix with all my master bus processing apart from the limiter, or a completely 'naked' mix. The latter sounded completely different, so he worked with the former, and did an excellent job of making it as loud and bright as Greg wanted without introducing still more compression artifacts. Time will tell whether the results help Glymjack to break into the festival circuit, but I think SOS can consider our debt repaid!